British super-bantamweights Scott Quigg and Rendall Munroe must put world title ambitions on hold as their interim WBA contest at Manchester Velodrome was ruled a technical draw. The first two rounds of the highly-anticipated domestic contest bubbled under nicely before an accidental clash of heads at the start of the third left Leicester's Munroe with a deep cut above his right eye. An anticipated showdown between the winner and Commonwealth champion Carl Frampton must now be placed on the back burner, with a rematch expected to be arranged between the two fighters from Ricky Hatton's promotional stable. Munroe's customary come-forward style was in evidence from the outset as he looked to force a taxing pace upon British champion Quigg, nine years his junior. But the former European king was largely frustrated by some eloquent defensive work from the Bury prospect, who fired back with some precise combinations to the body. Both fighters looked to force the issue in the third when the untimely end came. Quigg connected with a crisp right to the temple but as each man lunged in - Munroe from his southpaw stance - heads came together and the severity of the injury was soon apparent. With the in-ring combat concluded, scenes of violence then broke out in the crowd as an anti-climactic evening ended on an unsavoury note. 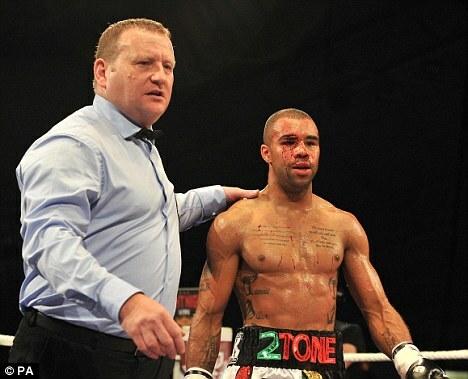 Hatton Promotions director of boxing Richard Poxon told the post-fight press conference he expects Munroe to be sidelined for around two months with his injury before a rematch can take place, meaning Quigg is unlikely to enjoy the swift ring return his trainer Joe Gallagher would like to see. 'I went in to throw a right hand and the heads came together - it happened so quick,' said the British champion. Similarly, Munroe also felt his gameplan was having the desired effect. 'I'd have put duct tape on the thing and carried on,' he said. The highly anticipated fight between Scott Quigg and Rendall Munroe for the WBA interim super-bantamweight title ended in disappointing circumstances on Saturday after a cut stopped the bout in the third round. 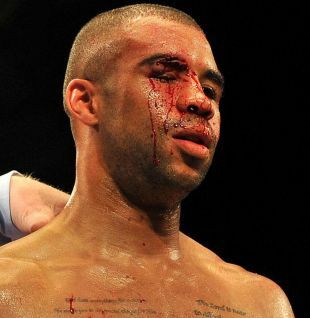 An accidental clash of heads opened a huge gash above Munroe's right eye, resulting in a technical draw after 43 seconds of the third stanza. Munroe's frustration was obvious, but the encounter simply could not go on with his eyebrow completely split. All in attendance shared his dissatisfaction though after the stoppage arrived just when the fight was showing signs of becoming a classic. Munroe had taken the first round before Quigg claimed the second, so the night's action revealed little as to who is the best super-bantamweight in Britain. Quigg had entered the ring as favourite, boasting an unbeaten 24-fight record and coming off a superb seven-round hammering of Jason Booth. He still has question marks over his chin, having been dropped in the past, but he appears to be improving with every fight. There was a nervous look about Quigg, though, as he waited for the opening bell, and it translated to his boxing as Munroe emerged from his corner as the aggressor. Boxing out of his southpaw stance, Munroe landed a thudding lead uppercut and certainly did enough to take the opening stanza. Quigg improved his work greatly in the second, landing a huge right hand and picking his man off as he grew in confidence. However, as they started the third, both men threw simultaneously - leading to the collision of heads - and Munroe was pouring with blood when the doctor stopped the fight. "There were two warriors out there, I wasn't even warmed up yet, but that's how the game goes," Munroe said on Sky Sports. "I'm frustrated I can't take a belt home for my kids, it's Father's Day tomorrow. "I haven't seen the cut yet but I can see the grimaces on people's faces. I'm fine though, if he wants to go and complete the 12 rounds I'm up for that. Obviously the doctor said it can't be done." Quigg added: "We were both coming to throw and the heads clashed. That's boxing. Everything was going to plan, I was making him miss, using my feet, wasn't get hit at all, I had a perfect camp." Promoter Ricky Hatton said the fight would happen again in the future, confirming: "It's got to be a rematch. Looking at Rendall's cut, that's horrendous. But it's a rematch, we want to find out who's the best in Britain."